Yesterday evening, I had a few strawberry one hour before asleep, and I washed them quite carefully by putting them into the salted water for a few seconds and then flush them. I heard that the salted water may help to kill some of the bacteria. But when I woke up this morning, I feel very uneasy about the stomach and stayed in the bathroom for too long to even miss the bus to work. And I don't dare to drink the first drink of water this morning in case I Feel like uneasy again on the road to work. I wonder if the strawberry is containing some pestiside or something that may not be easily get rid of. Oh, the food safety problem, always making us innocent people crazy. What can I do, never eating them or wash them again and again. 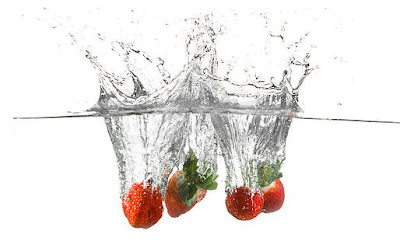 So I suggest that when eating the strawberry, don't ever save the time to wash them.You have no idea what it has been absorbed in the process of its growing, I bet they are not grown in the natural wild state, there is seldom any natural food exist today, even there is, they must be extremely expensive.